A proposed detour to circumvent a bridge project in Millsboro next spring will alter traffic patterns for an estimated two weeks. Motorists traveling south on Route 113 next spring may get the, let’s say, opportunity to take a scenic tour of parts of Millsboro. The Delaware Department of Transportation (DelDOT) sent representatives to the July 2 regular meeting of the Millsboro Town Council to discuss plans to fix a series of concrete-encased steel beams on concrete abutments attached to a bridge over Iron Branch, in close proximity to the Hardee’s on the highway. DelDOT has looked at two plans to do the repairs: The first would involve lane closures and would take approximately eight months to finish. 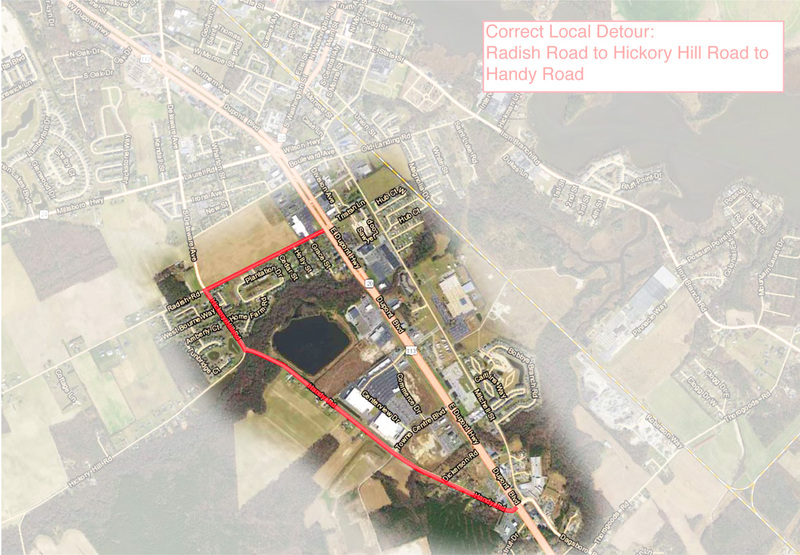 The second, which DelDOT and town officials have said they prefer, would involve closing down part of southbound Route 113, detouring motorists along Radish Road to Hickory Hill Road, then to Handy Road and back to Route 113. That second plan would take about two weeks to complete. The core of the bridge was originally constructed in 1916, to carry the then-new T. Coleman du Pont Highway over Iron Branch in Millsboro, according to DelDOT. That bridge was later modified two more times, to accommodate wider shoulders and to dualize the highway. According to Hastings, each bridge in Delaware is inspected every two years, and it was discovered that the steel beams on this bridge “have significant corrosion and loss of section,” according to DelDOT’s website. The existing bridge is ranked 72nd on the 2018 DelDOT Bridge Deficiency List, according to the department’s website. DelDOT will host public workshops on the proposed rehabilitation project, to both present details of the project and solicit feedback from the public, according to DelDOT. A live workshop will be held at Millsboro Town Hall & Civic Center on Thursday, July 26, from 4 to 7 p.m. A virtual workshop will be available online. Interested persons are invited to express their views either online or in writing, according to DelDOT. Comments will be received during the workshop, or can be mailed to DelDOT Community Relations, P.O. Box 778, Dover, DE 19903, or can be emailed to dotpr@state.de.us. Hastings said he believes the public will agree that the two-week plan, though more dramatic and inconvenient than the eight-month plan involving lane closures, is more efficient and advantageous. Hastings said the estimated total cost of the project — including construction, contingency and construction inspection — is $1.5 million. Hastings also said that all businesses and homeowners beyond the closure will have access maintained throughout the duration of the project. If the project gets the final thumbs-up and moves forward, DelDOT expects the design work to be completed by the end of this summer, and the construction has to be finished no later than the spring of 2019. The actual construction phase of the project would involve the continued use of steel beams, but they would no longer be encased in concrete, according to Hastings.